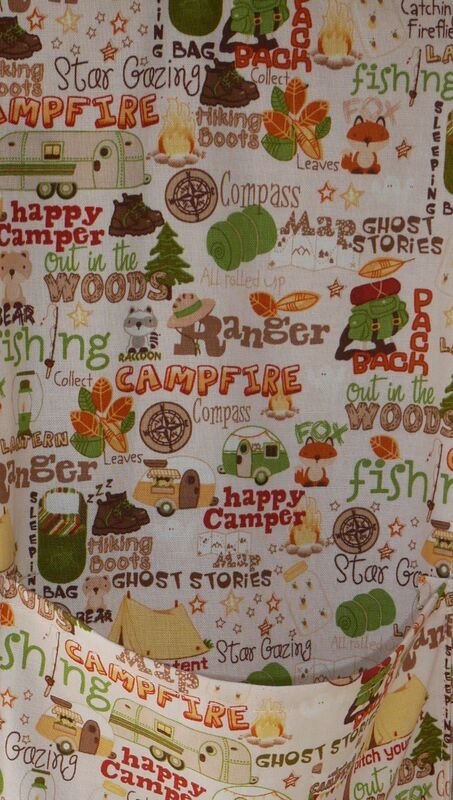 Gosh - BrianTheSnail got mentioned in dispatches on SMHF when someone was looking for ideas for projects with her sewing machine for her campervan. 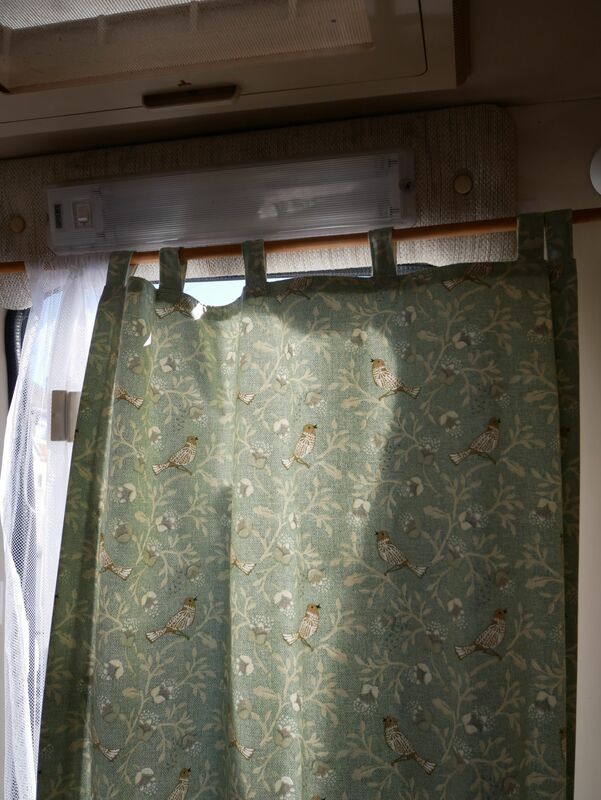 They are lined and heavier and longer than the originals supplied with the van and simply replace them using the same caravan curtain tape on the same curtain runners. The middle curtain is supported by a standard net curtain wire attached to the front seat headrests. This isn't strong enough to support the new heavy curtain without it drooping significantly so a piece of thin fibreglass rod (a pole from an old kite) is slipped in to the curtain channel to provide added stiffness. Note the pockets for Kindles, specs etc. On the cab side there is a velcroed flap covered pocket containing two hi-viz vests thus satisfying EU requirements for having access to such vests from inside the cab and also providing nice out of the way but easy access storage for them. Annoyingly I didn't snap the two super strong suction cups that have hooks just the right size to hold that thin (and hollow, which is why it bends slightly) dowel rod. The hooks are sufficiently strong that the curtains have only fallen down a couple of times in quite a few years. Note the mesh fly-screen - a cheapie store magnetic one cut down to fit. 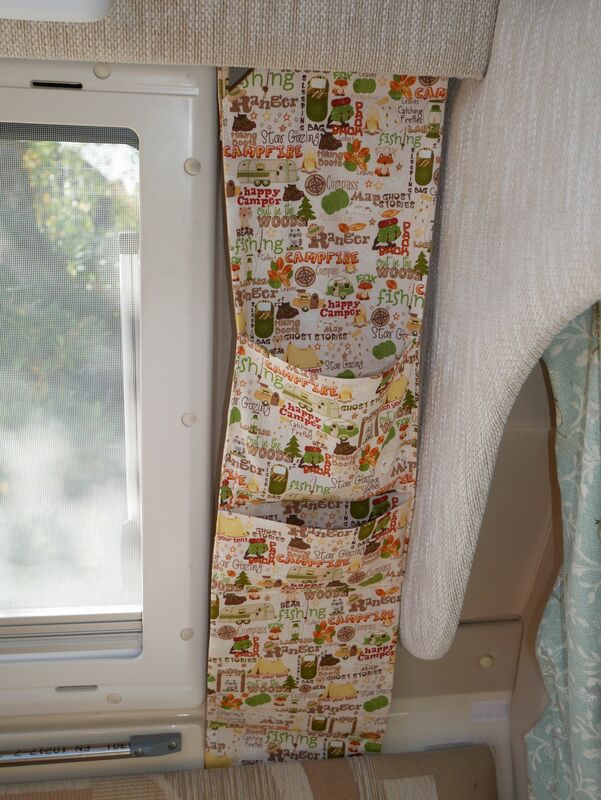 With a combination of velcro on the curtains and van we can have the curtain right across to stop draughts or at nightime or held back with a tie-back and similarly for the fly-screen. But we also like good back support - so a couple of lumbar cushions - mines an old crescent shaped buckwheat-filled neck cushion whilst Liz has a more conventional lumbar roll - the fabric was choosen because it has both an owl (Liz's motif) and a snail (mine). I sit on the other side and so already have the van long backrest cushion for the lower part so my case just contains an 18"x12" cushion - not bothered to photograph. The cases will definitely not be that drab green next year - these were prototypes, knocked up out of a couple of old pillowcases. At night time the 18" cushions make our pillows whilst the 12" fits in the gap between use - making pillow coverage across the width of the van. Oh, how do they fit? We bought some 1/2" aluminium tube and it fits neatly into cup hooks screwed underneath the van's pelmets. IKEA Sunnestra hooks fit neatly onto this and the other end hooks into a but of curtain header tape on the back of the cushion cover case - as shown below..
Whilst on the subject of comfort - no van is complete without a quilt or blanket, useful for legs in the evening and as an extra layer on top of the sleeping bags when the nights get cold. We still haven't decided whether to drape them over the seats but Liz added 'pockets' to her quilts so they would fold up neatly into the pocket and so make nice scatter cushions. 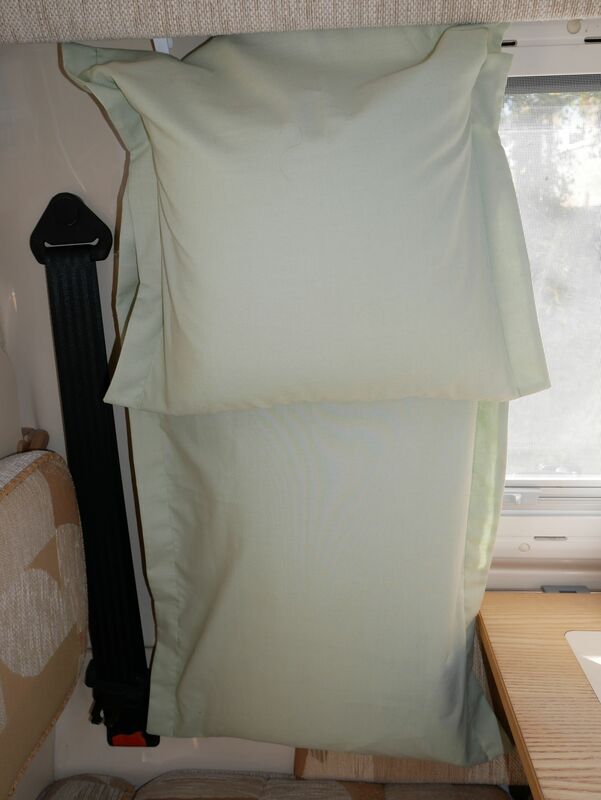 Of course, having the bed pillows hung up as backrests during the day means they are out of the way and so don't take up storage - otherwise they would have been the scatter cushions - and then what would we have done with the quilts? We've got three different hand-made quilts in the van with different designs and ideas but they all fold up and tuck in like this. 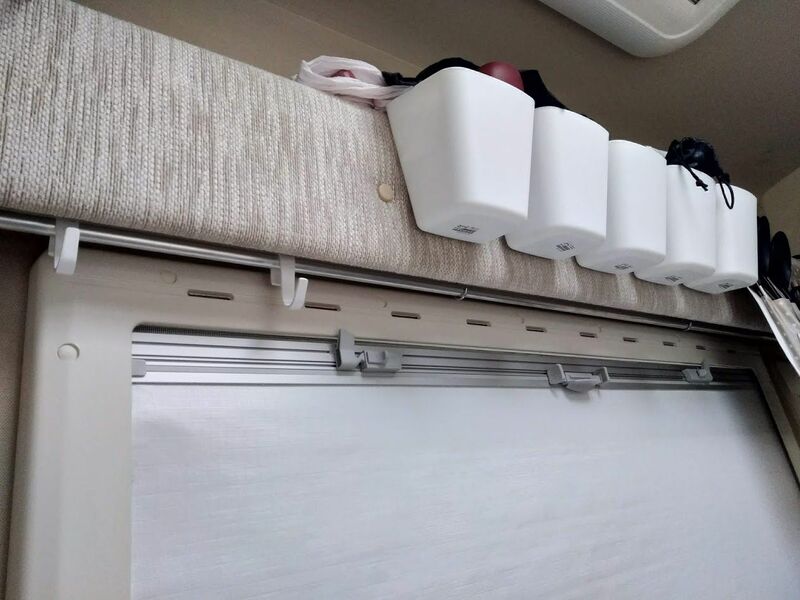 And recently at the head end of the bed (we sleep with heads nearer the cab) she took advantage of the new aluminium rail to make little storage hangers for specs and phones etc. Now here's a simple idea but one we find effective. Little drawstring bags to hold our pewter pint tankards and stainless steel tea mugs. The mug bags aren't shown in the picture below because after a few weeks of merely being rinsed out the mugs need a proper, at least twice, dishwasher clean to remove the tannin stains (yeuk! think what all that tea is doing to our stomach linings). Anyway the tea mugs and bags are in the house but here's the pint tankards, note the his'n'hers colour coded toggles. Now, you might be tempted to hang your pewter pint mugs by the handles directly on hooks. DON'T! You can clearly make out the discolouration on the fabric, particularly to the left of the shot where free-swinging pewter has rubbed off and left an 'orrible mark. Not sure how we are going to clean that.